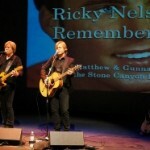 “Ricky Nelson Remembered” featuring Matthew and Gunnar Nelson will visit South Point May 3 –5. The show filled with their father’s hit songs like “Hello Mary Lou” and “Garden Party” also showcases his life and career through his music and interviews from artists he influenced, including Paul McCartney and Chris Isaak. Gunnar and Matthew, who are rare mirror-image twins, have had their own stellar careers before embarking down memory lane with their dad’s music. The boys were playing in clubs at age 12 and had their own No. 1 hit at age 22 with “(Can’t Live Without Your) Love and Affection.” This put them in the “Guinness Book of World Records” as the only family in history with three successive generations of No. 1 hit makers. Their grandparents were Ozzie and Harriet from the famous family television show that aired on ABC from 1952-1966. This tribute show came about accidentally 10 years ago. “The commander from a naval base in Japan was a big Ricky Nelson fan and his request was that we only play dad’s music,” said Gunnar. The twins had one week to learn their dad’s songs for the soldiers who couldn’t get home for Thanksgiving. “We were playing to 18 to 20 years-olds who had never heard the music before. Gunnar and Matthew were 18 years old when their dad died in a plane crash on his way to a New Year’s Eve concert in 1985. His legacy includes 53 hit singles on the Billboard Hot 100 and 19 other top-ten hits and being a member of both the Rock and Roll Hall of Fame and Rockabilly Hall of Fame. The boys found their dad’s song list from the fatal tour and follow it now. Ricky Nelson was also a Golden Globe winner for his performance alongside John Wayne in “Rio Bravo.” Gunnar realized his dad had to make a concrete choice…film acting or music. “When the TV show was canceled, he focused on living and dying for music,” said Gunnar. It was music that made the twins so close to him. Gunnar also made a major decision after the boys were a musical guest on “Saturday Night Live.” At the time, Matthew was the lead singer and bassist, while Gunnar played the drums. After the show, Gunnar’s epiphany was to start sharing the front stage with his brother after he learned to play guitar, which he did in one year. 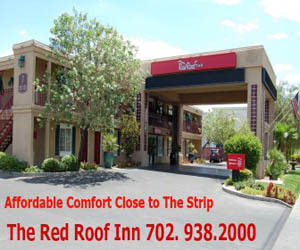 Tickets range from $20 to $30 (not including tax and fees) at the South Point Casino Box Office, via phone at 702-797-8055 or 1-866-796-7111 or online at TicketReturn.com.